The communal bathroom area is clean and spacious with un-metered hot showers. There is also a laundry room with washers and dryers for your convenience, and wireless internet available at these cabins. The Kitchen cabin has a Double bottom single top bunk and 2 single bunk type beds. The beds have bottom sheet and pillows only.These kitchen cabins are fully equipped with cooking utensils, crockery and cutlery and fridge/freezer. The communal bathroom is clean and spacious with un-metered hot showers. There is also a laundry with washers and dryers for your convenience, wireless internet available. 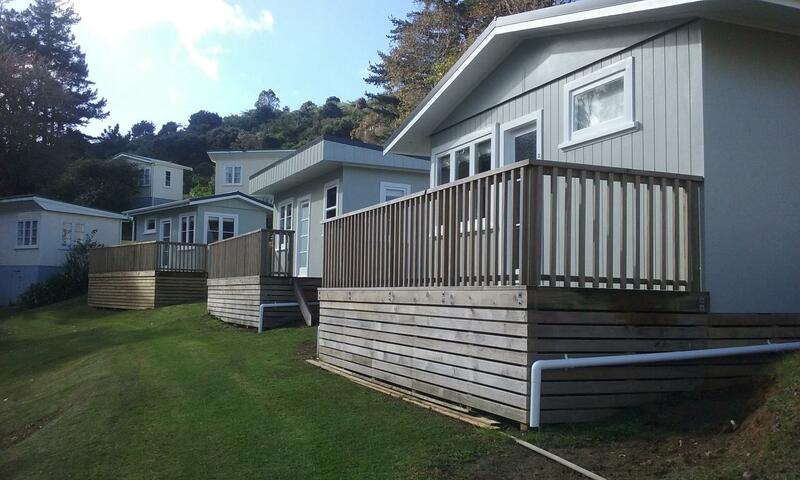 These Standard Cabins are a more basic type of accommodation with a small deck. There are 3 Standard cabins with decks, 2 have double bottom single top bunk and 2 single beds sleeps 5 max and 1 has a queen and 2 single beds, sleeps 4 max. All beds have bottom sheet and pillow only, and a fridge/freezer. The communal kitchen and dining area is available for your use and has the essential facilities provided. The kitchen is fully equipped with cooking utensils, crockery and cutlery. The communal bathroom area is clean and spacious with un-metered hot showers. There is a laundry room with washers and dryers for your convenience, wireless internet available at the cabins. sleep 4-6. All have 4 bunk beds ( 2 bottom 2 top) and 2 bench type beds with bottom sheet and pillows only. They have a fridge/freezer. 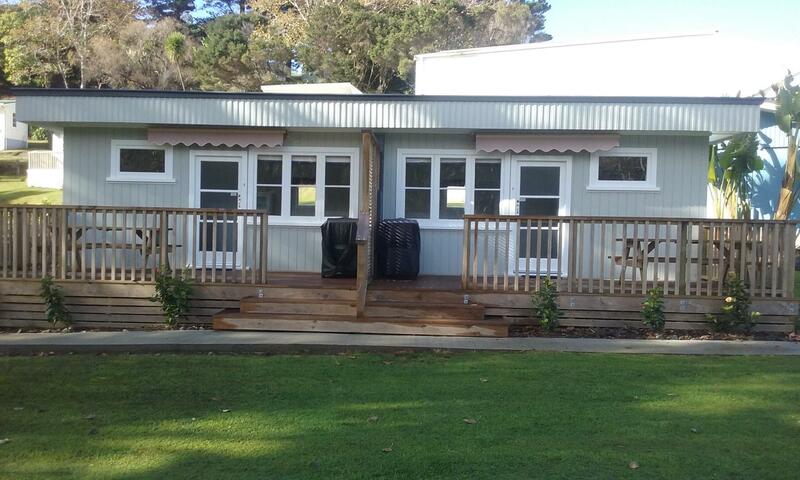 Beach front Holiday Park in a 5 acre tranquil setting. Shop attached to reception where you can purchase supplies for your stay. How far away are you from landmarks? Pet friendly by arrangement, Power and Tent sites only. No refunds will be given for cancellations made less than 30 days before due date of arrival unless the site or accommodation is able to be re let. Cancellations more than 30 days in advance will be refunded less 20% booking fee. No refunds will be given for early departure. Children 2 years and under are free, 3 - 14 years child rate applies.